a moulded trim that covers the join between the box-frame and the wall. As with other mouldings, this can provide a clue as to the age of the window. a pulley wheel set in the pulley stile over which the sash cord runs. The wheel can be cast iron, brass or nylon, the mounting plate is generally cast iron or brass. the bottom rail of the bottom sash is deeper than the other rails to allow for the slope of the cill. the base on which the whole box-frame is built. In better quality work it will be made of hardwood (in the best, English oak). It is shaped to shed water. not a traditional component of a sash window, the draught strips may be incorporated into the staff and parting beads and the bottom and meeting rails. Another type is inserted in a groove in the edge of the sashes. traditionally single glazed, modern sash windows are now made to take sealed double-glazing units. Single glazing may be a requirement when restoring/conserving listed buildings. a short extension of the sash stiles beyond the meeting rails to strengthen the joint. With modern techniques they are not necessary, but they are a typical and decorative feature of a traditional sash. the timber that forms the inside face of the sides and head of the box frame. The staff bead is fixed to the inner edge of it. the top rail of the bottom sash and the bottom rail of the top sash are called the meeting rails and are generally rebated for weathering and security. the nosing projects as a ledge from the bottom of the inside of the frame. 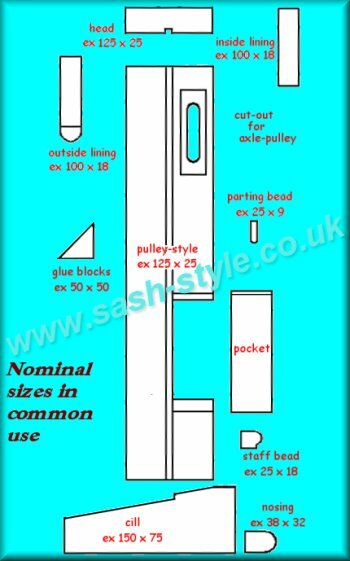 As sash windows are usually fixed in the inner skin of brickwork, there isn't the depth for a full window board. an alternative method of suspending sashes uses a spiral mechanism with a spring that is tensioned to counterbalance the weight of a sash. In a trdaitional box-sash they are set into the edges of the sash stiles, in modern sash windows they are grooved into the frame stiles. the moulded bead that holds the bottom sash in place is nailed or screwed to the inside lining. A draught-strip can be incorpoated into it. a closeable vent to allow a small flow of air. Trickle vents are required in new windows to replace the air movement that we call a draught when it comes in around the sashes! where you put your plants and ornaments! More usually, a sash window has a nosing rather than a window board. A pocket is the cover to an opening in the frame. The top is wedged into the pulley-stile and it is secured by a screw at the bottom. In most cases it is fairly simple to remove the screw and prise the bottom of the pocket out, though due to a build of paint-layers it can sometimes be hard to locate the screw. A mouse is what you use to pull sash-cords through the box sections of sash-window frames. It is basically a weight attached to a piece of string, the main requirement being that it can be threaded over an axle-pulley. A traditional way to make a mouse uses a piece of lead flashing, about 50mm x 20mm rolled round the knotted end of a piece of string and hammered so it grips the string. If bent a little it goes through the opening above an axle-pulley easily. As with many old-fashioned techniques there were hazards that people were unaware of, in this case the toxicity of the lead - so don't make one this way! Anything heavy enough to drop down inside the box section and thin enough to be threaded through will do. I've heard that a short length of bicycle-chain works, but I've not tried it.